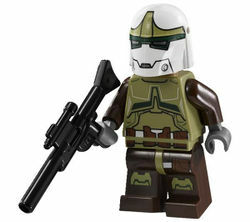 The Separatist Bounty Hunter is a minifigure released in 2013. The Confederacy of Independent Systems often hired bounty hunters during the Clone Wars to help achieve their objectives against their enemies. This minifigure strongly resembles Rako Hardeen, a bounty hunter who was hired (unknowingly by the Jedi) to kill Obi-Wan Kenobi, which was actually a Jedi plot to gather information about the Separatists. Obi-Wan then impersonated Hardeen and was sent on a secret mission to protect Chancellor Palpatine's life. He has the Mandalorian helmet, but in white with different printing. He has the same head as Jace Malcom. Facts about "Separatist Bounty Hunter"
This page was last edited on 10 January 2016, at 00:27.